Conrad Schmitt Studios is recognized for its expertise in the conservation and restoration of antique statuary. This includes seamlessly reattaching broken pieces and re-creating missing portions. Artwork frequently is provided as a component of interior design and restoration projects. A renewed spirituality is often apparent in the artwork. Over the years, our Studio has cultivated an expertise in restoring statuary. 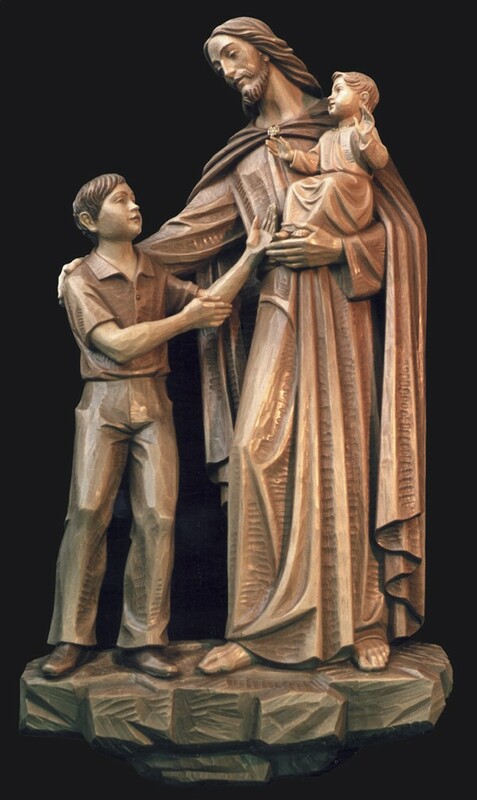 We are particularly proud of the restoration of the wood carved Stations of the Cross from the Cathedral of St. John the Baptist in Savannah, Georgia. 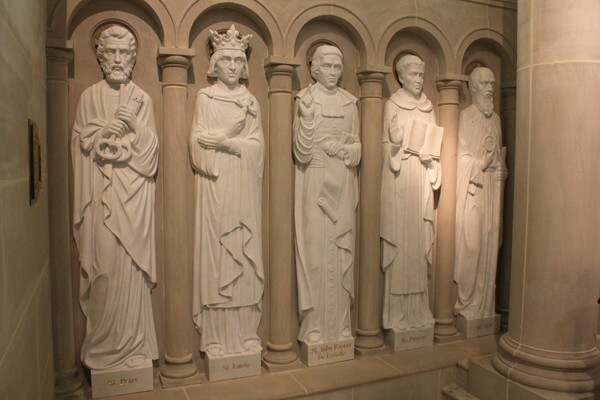 These statues, most recently painted in monochromatic tones, had been painted four times, all in various styles. Artists began by stripping and smoothing unstable paint surfaces. Missing fingers were then carved and securely affixed, wood cracks were filled, and the original skim coating of plaster over the wood was repaired. The statues then were painted with sealer, followed by the polychromatic painting, which produced colorful garments and realistic skin tones. Layers of glazes were then added to give depth to the sculpting, bring out the detail, and seal the new paint. Lastly, missing elements such as a leather whip were recreated. The project’s success was emphasized when a priest visiting the studio exclaimed that they were the most fantastic Stations of the Cross he had ever seen. 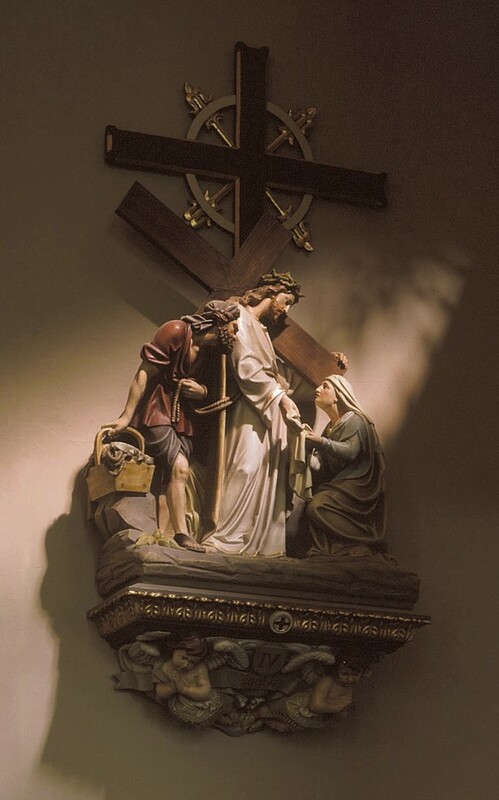 Though the Stations of the Cross may be the most fundamental statuary in a church, other beautiful pieces must not be forgotten. We have been privileged to work with other pieces so beautiful that the sight almost seems a glimpse of heaven. Our restoration of four, 48″ high angel statues for St. Michael the Archangel Catholic Church in Convent, Louisiana is an example. The angel’s finishes had deteriorated and they had suffered significant plaster damage which included missing hands and feet. The extensive plaster repair included molding and attaching the missing parts. New plaster areas were primed. Fragile paint surfaces were stabilized. A barrier varnish was applied to the statues, followed by the polychromatic painting, which restored soft, realistic color and luminous skin tones. Layers of glazes were added to give depth to the sculpting, bring out detail and protect the new paint. Restoration of the angels was executed during the time when Hurricane Katrina devastated New Orleans. The restored angels became an inspiration not only for St. Michael the Archangel Parish, but also for the hurricane evacuees taking refuge in Convent, Louisiana. Artists continue to perform the traditional art of wood carving to make traditional and contemporary statuary and sculpture. A timeless beauty, wood statuary has held its place as décor in churches through the centuries, becoming even more precious, defined, and valued with age. Whether the piece is left in its natural form, or whether it is colored with painting oils, a wood sculpted piece brings a warm, historical element to the space it occupies. 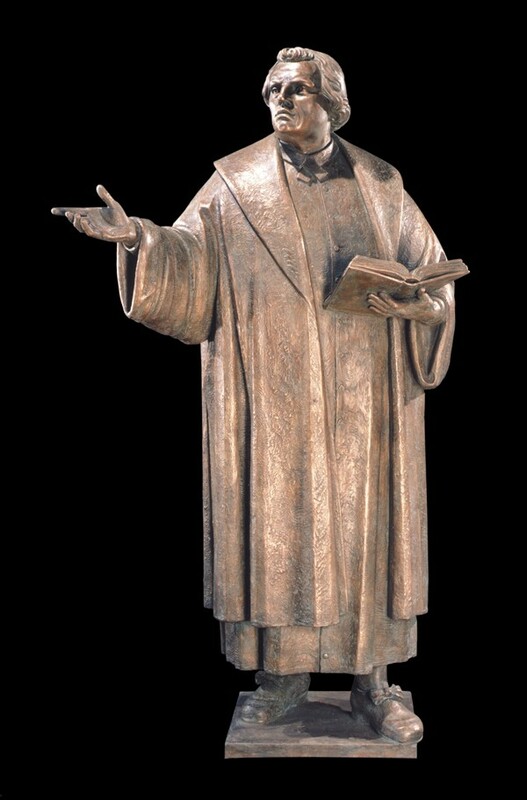 Bronze castings are one of the most durable art forms in existence. Used for both art and weapons, bronze artifacts created more than four thousand years ago are still found in museums around the world. The first step of creating bronze statuary or sculpture begins with a sketch. The artist then creates an original sculpture of wax or clay. Then a flexible mold is made from the artist’s original. This mold captures every detail of the artist’s original work, and is one of the most critical phases in the bronze process. The ceramic shell is removed from the kiln and molten bronze is immediately poured into the form. 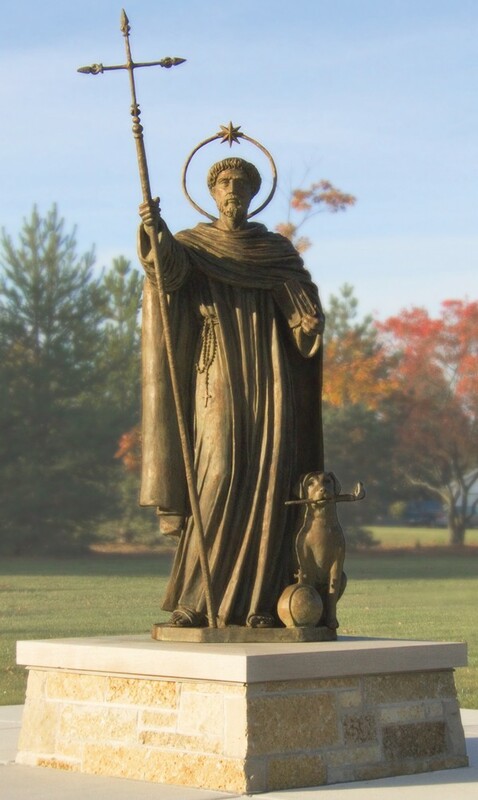 The bronze is poured at a temperature of 2100° Fahrenheit. Bronze is an alloy of 95% copper, .02% lead, .02% tin, .06% zinc, 4% silicon. After cooling for several hours, an artisan sands and polishes the sculpture and the bronze is treated with chemicals and heat to provide the desired color. The patina is sealed under a wax coating and becomes a permanent part of the sculpture. A relatively new medium, fiberglass, also known as glass-reinforced polyester, has become a popular choice, due to its ability to withstand various outdoor elements. Through Northern winters and Southern rains, outdoor fiberglass statuary and sculpture retains its beauty. Artists create fiberglass works from a variety of different decorative styles, and for a variety of different settings, from cemeteries to courtyards. A sketch is first developed and, once a design is approved, artists custom make the larger, final statue or sculpture. Artists then treat pieces that will be used outdoors with bronze, silver, marble, or aluminum finish to help it withstand its exposure to harsh elements, such as snow, rain, hail, and seasonal changes that result in freezing and warming. Indoor or sheltered artwork may be decorated with oil colors to give the piece a more traditional look. Since the Renaissance, marble statuary and sculpture has been known for its timeless beauty. Though it is more expensive than other materials, marble is the medium of choice for fine art pieces throughout history for its texture and durability. Marble is formed when the limestone is transformed by heat and pressure after being overlain by other materials. Its surface is slightly translucent, which allows artists to fashion abstract shapes with great depth and complexity, or to detail the most realistic sculptures with the material’s softness and depth. Artists create sculptures and statuary using a very similar method to that used in the 1500s. The artist uses a hammer, mallet, chisel, and sometimes even a hand drill. The hammer is used first, on rough stone. When the hammer strikes the end of the chisel, energy is transferred in a line down the contour in the form of a break. The harder the hit, the deeper the point moves into the stone, and the more material is removed at a time. Then the marble is hit directly to bring about finer detail with a mallet and chisel. The sculpture is finished with special pointing tools and files, such as rasps, abrasive stones, or sand paper to smooth the surface contours. Following the sandpaper, tin oxide is used to create a high-luster polish on marble. As marble ages, it becomes more durable, though compared to bronze, marble lacks ductility and strength, requiring more planning before sculpting. Marble also has a tendency to absorb skin oils, which can lead to staining. Marble is best kept indoors, as it can be altered by acids in rain. 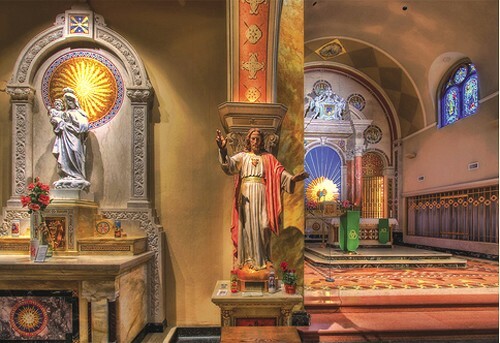 Conrad Schmitt Studios has been designing altars, ambos, chairs, baptismal fonts, ambries and pulpits for over 120 years. Our historic resources offer thousands of examples to compliment interiors as well as more modern architecture. 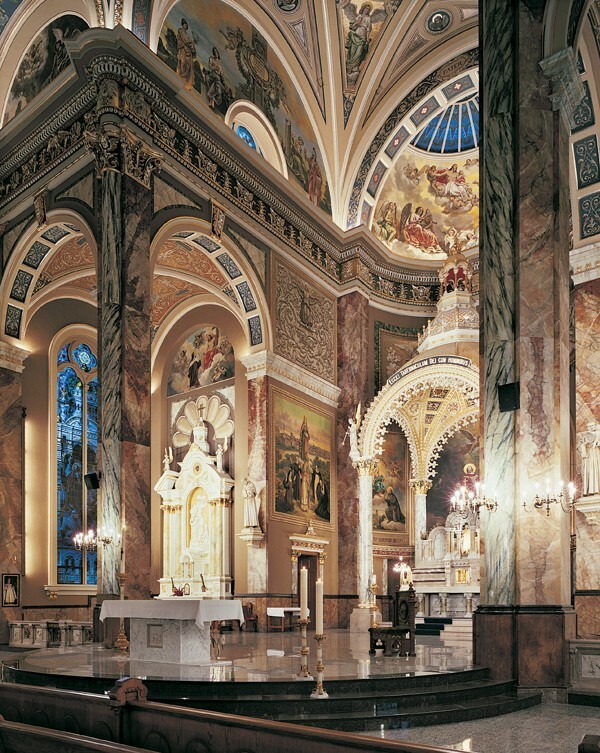 While the altar of sacrifice remains the most prominent and important permanent structure within the church, the other fitments must harmonize and balance to create a unified space.